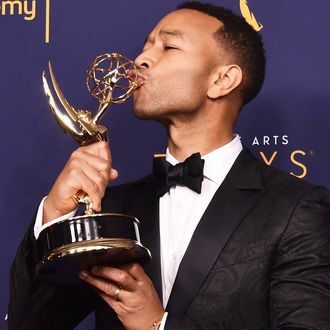 What would Jesus do at the 2018 Creative Arts Emmys? That’s goddamn right, he’d absolutely EGOT for his work on the televised production of Jesus Christ Superstar, just like lyricist Tim Rice, composer Andrew Lloyd Webber, and star John Legend. The three won as executive producers of the NBC live musical, which took home this year’s Outstanding Live Variety Special award, making the trio the 13th, 14th, and 15th persons to ever win an Emmy, a Grammy, an Oscar, and a Tony. Late producer Craig Zadan, who died on August 20, also won a posthumous Emmy for his producing role on the project.